Our Trees for Public Health program primarily focuses on removing impervious surfaces (the asphalt and concrete that overheat our neighborhood streets) and planting street trees on public city property, increasing community engagement in neighborhoods within the Harris Creek Watershed. TPH began in 2012 with the planting of the McElderry Park Neighborhood (with 450 trees) and has completely planted up seven neighborhoods in the Harris Creek Watershed, thus building a coalition of community associations and resident members in the process. 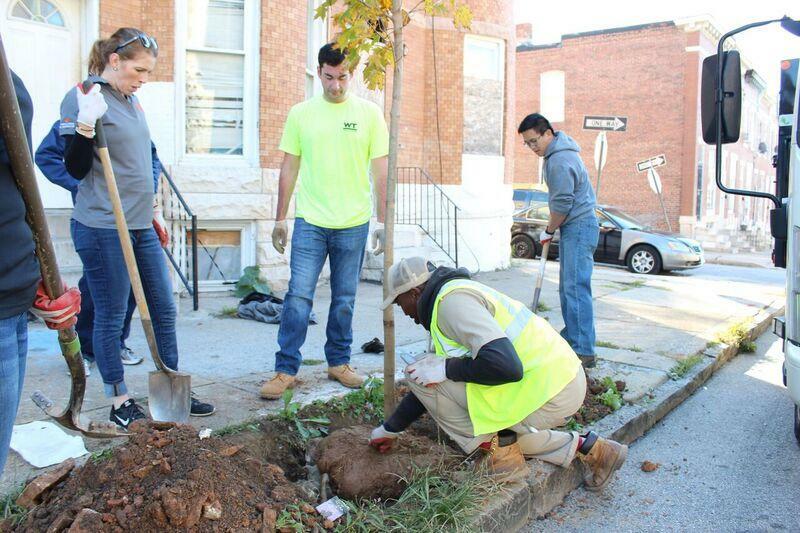 Our team at Baltimore Tree Trust has also spearheaded an initiative called Putting Down Roots. This initiative works with landowners in Baltimore City, like the Archdiocese of Baltimore, to increase the tree canopy on private properties. Inaugural funding for these partnerships has been provided by the France-Merrick Foundation, for $200,000. We have planted over 1,200 trees on 9 private properties since Putting Down Roots started in 2015.